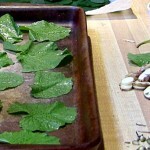 Garlic Mustard leaves ready to be toasted in the oven. These are just on type of wild green that can be harvested at Solstice time. We have covered twelve of the most common examples you are likely to find growing at the beginning of winter. Despite the frosts and frigid weather at Solstice time, there are still fresh greens to be foraged, if you know where to look and what to look for. Many of these plants, although not always abundant, can be found throughout the winter months, providing a fresh source of vitamin C, as well as other valuable nutrients. Many of these cold weather tolerant plants belong to a single family – Brassicaceae, the mustard family. These include such common species as Garlic Mustard, Dame’s Rockets, Wintercress, Bittercress and Watercress. 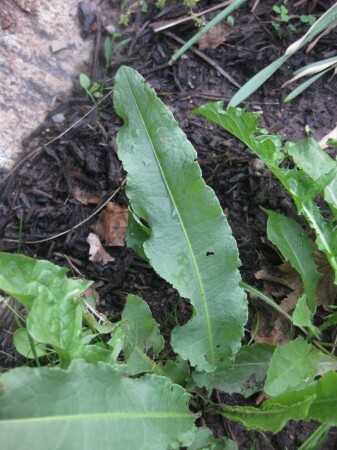 Other hardy greens include Common Chickweed, Yellow Dock, Sheep Sorrel, Clover, Field Garlic and of course Dandelion. Most of these greens can be easily incorporated into any number of dishes, even if it is as simple as chopping them up and sprinkling them over a slice of pizza or tossing them into soup. In some cases one can get quite creative and design dishes that use the unique character of the plant. 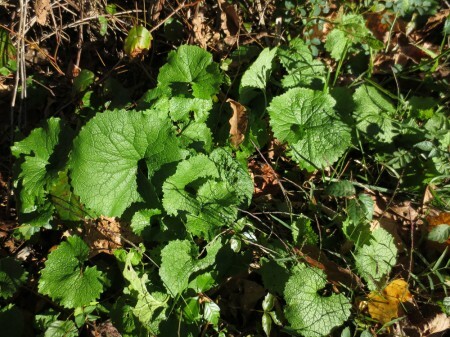 Overwintering garlic mustard plant. Notice rounded leaves. Garlic Mustard (Alliaria petiolata) is an invasive biennial that grows in abundance throughout the region and seeds itself after it has flowered in the summer of the second year. By the fall, many of these seeds have grown into seedlings which overwinter as loose rosettes of leaves. Unlike the foliage of the mature plants, these primary leaves are almost round and often grow quite large. They can be picked and used in salads, as cooked greens or dried and crumbled for use as a spicy condiment, but my all time favorite way of preparing them is to brush them with oil, sprinkle on a little salt and toast them in the 325 degree oven until crisp and light, about 5 min. Dame’s Rockets rosette. Notice the irregular scooped teeth around the margins. Dames Rockets (Hesperis matronalis), has a showy springtime blossom which I often use in cooking or as a garnish. However, it’s foliage can be found growing year round, tolerating the bitter cold of winter. 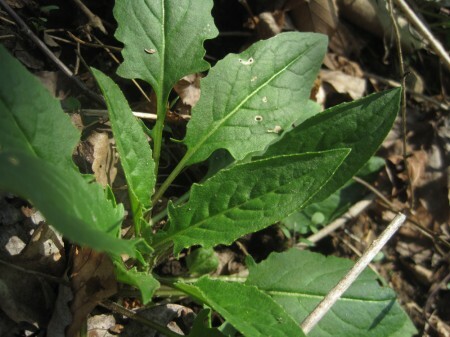 It has rough, hairy leaves which become tender when boiled, and taste much like other cooked mustard greens. Typical of biennials, it is best harvested before it puts out flowers, during the second year. Overwintering Wintercress. Note the dark green glossy leaves. 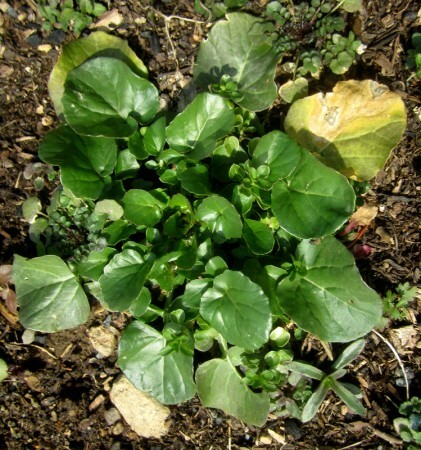 Wintercress (Barberea vulgaris) is a plant replete with showy clusters of yellow flowers. It tends to grow in large patches which makes it easy to harvest. As its name implies it stays around during the winter months in the form of rosettes of dark green glossy leaves. The greens are rather bitter and although they go well in a mixed salad, you may prefer to boil them in a change of water and use them like mustard greens. I enjoy adding them to stir fries and soups as they have a texture akin to spinach. Pennsylvania Bittercress (Cardamine pensilvanica)grows in small rosettes of pinnate leaves that begin growing each fall. They remain dormant throughout the winter, then revive and flower in March. During April when the seedpods ripen I love to walk through patches of Bittercress to watch the seeds firing off in every direction as they are released from their spring loaded pods. 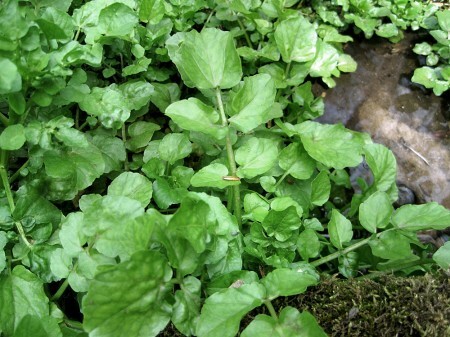 The leaves have a similar spicy flavor to watercress. They are best eaten raw in salads or in sandwiches. Earlier this year we used some in place of basil to make pesto. It was spicy and delicious. At this time of year it can be found growing in abundance. Watercress (Nasturtium officinale) likes to grow in clean flowing water, and although it won’t be abundant at this time of year, enough can be gathered to add to a salad. I’ve found that it lacks some of its spiciness during the frosty weather, but it still retains its familiar flavor. Like bittercress, it should be eaten raw as cooking diminishes its flavor and goodness. It is rich in vitamin C, calcium, beta carotine and iron. Yellow or Curley Dock is distinguished by its long rippled leaves. Yellow dock (Rumex crispus) has a rather tart flavor, owing to its content of oxalic acid, common to the buckwheat family. It is not the most choice greens, but when cooked into a dish such as a vegetable lasagna can be quite palatable. However it is best avoided altogether if one is prone to kidney stones. 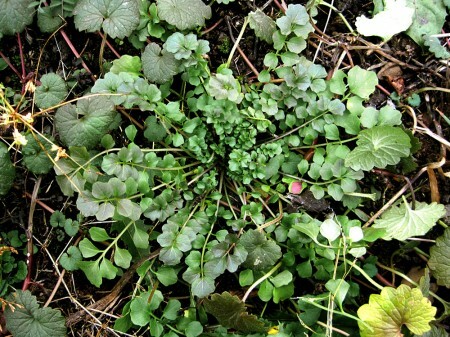 Chickweed grows in mats, especially in disturbed soil. 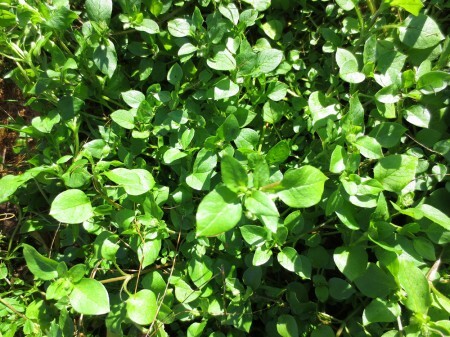 Chickweed (Stellaria media) is probably the best green to forage throughout the winter months. It laughs at frost and thrives in the snow. At this time of year, you will find it growing in lush patches, and may even find it blooming. This is the season for eating chickweed salads and making pesto. I recently made a fried rice dish, with chickweed and barberries. I added the chickweed leaves at the very end, so that they just wilted rather than shrivled, retaining most of their flavor and goodness. Sheep sorrel (Rumex acetocella) is a relative of yellow dock and like the other members of polygonaceae (the buckwheat family) it is high in oxalic acid, which gives it its characteristic lemony flavor. It tends to grow in patches as it spread by rhizomes under the soil, which makes it relatively easy to gather. 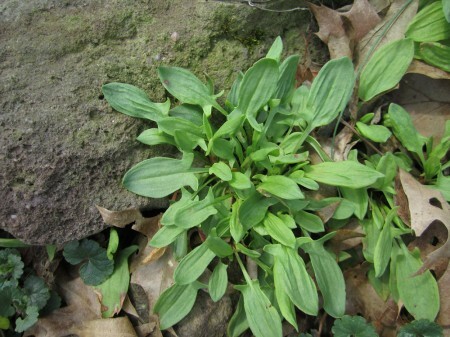 There are many ways to use sheep sorrel in meals, either raw or cooked. It is another good flavor to use in pesto, especially as it is tender throughout and leaves no stringy texture (unless you use the flower stalks). However, the most popular use of sorrel is as the base of a creamy soup. There are many versions of sorrel soup to be found on line, but I have found that the simple ones are the best. 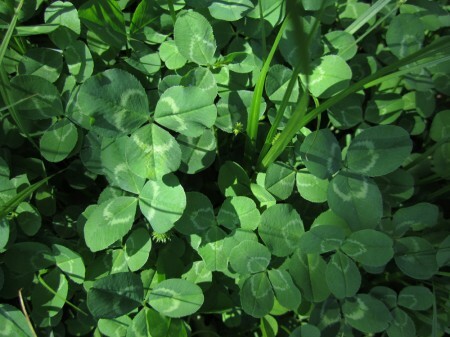 Clover (Trifolium spp) is another abundant edible leaf that can be tossed into salads, soups, stir fries and fried rice. Red clover leaves are generally bigger, easier to harvest and a little more palatable than the white species. However, it is a pain to harvest and not that choice, so I’d only bother if there’s nothing else available. Dandelion (Taraxacum officinale) leaves tends to stick close to the ground at this time of year, but you’ll still find some quite leafy plants in more sheltered areas. No matter what, they need to be thoroughly washed to remove grit and soil. The greens tend to be bitter, which makes them difficult to eat raw, except in the early spring. I tend to boil them twice in a change of water before cooking with them, which helps to remove the bitterness. At that point they can be used much like spinach. 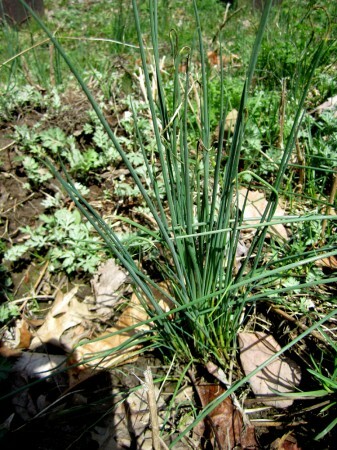 Field Garlic (Allium oleraceum) is a popular wild treat among children, who call it onion grass. 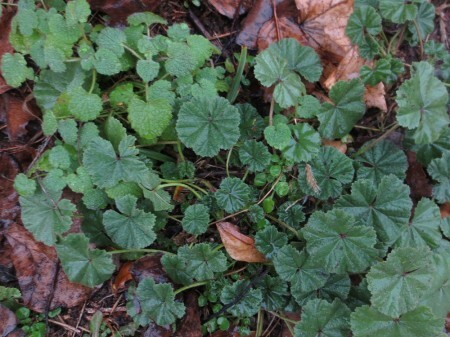 It grows in lawns and in wooded areas, preferring cooler weather. It resembles grass wil rounded blades, and has a distinct oniony smell when crushed. It is an ideal substitute for chives in cooking, or as a garnish for savory dishes. The younger shoots are preferable, as older plants become tough and stringy, but even these can be used in soups for flavor if they are chopped fine enough. It makes a great addition to pestos and saags. Common mallow (Malva neglecta) can be found in ground hugging patches and are therefore inclined to be gritty, so they need to be washed well before use. The leaves have a mild, pleasant flavor, making them a good substitute for lettuce in salads. As they contain mucilage, they can be added to soups to help thicken them. In fact the roots can be boiled in water to create a gooey substitute for egg whites in making meringues. As winter goes on, many of these plants will all but disappear, until their rebirth in the spring. But others, like chickweed and dames rockets are hardy enough to withstand frigid weather. If you want to be able to gather plants all winter long, you’ll need to scout the areas you frequent and memorize where the plants are growing. When it snows, you’ll know where to dig and what you can expect to find there. The point is that even though it may be the beginning of winter there are still things to forage and ways of getting fresh greens.